Happy Saint Patrick’s Day to you all. My last name may start with “Mc”, but I’m Dutch through and through. That won’t stop me from enjoying some Mint Chocolate Chip Ice Cream Sandwiches tomorrow though. 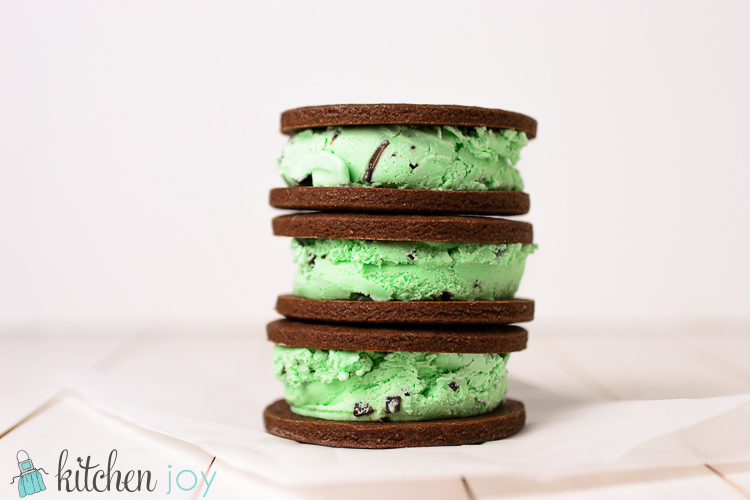 This recipe is actually for the chocolate cookies that make up the sandwich, it is not for homemade Mint Chocolate Chip Ice Cream. I have made it before though and someday I will share it with you, but I don’t color it green, so it’s not great for Saint Patrick’s Day. Feel free to use any flavor of ice cream you would like, store-bought or homemade both work great. My personal favorite would either be Mint Chocolate Chip or Homemade Peanut Butter Swirl. Since Homemade Ice Cream Sandwich Cookies are rolled out and cut like other sugar cookies, you can make them any shape you like. Rectangular like the store-bought ice cream sandwiches would work fine, or a cute shape. I opted for circles this time. I suppose shamrocks would have been even more appropriate. Maybe next year. Yield: Makes about 20 cookies. Enough for 10 ice cream sandwiches. In the bowl of a stand mixer fitted with a paddle attachment, cream the butter and sugar together. Add egg and vanilla and mix until combined. Add cocoa and mix well. In a medium bowl, whisk together flour, salt, and baking powder. Gradually add the dry ingredients a little at a time to the wet ingredients and mix until smooth. Wrap in plastic wrap and refrigerate for at least one hour. On a lightly floured surface, roll out dough to 1/4" thickness. Cut into desired shapes and prick a few holes in each cookie with a toothpick. Bake at 350 for 8 to 10 minutes until the edges are firm and the centers are just barely set. Cool on baking sheet for 5 minutes then transfer to a wire rack to cool completely. 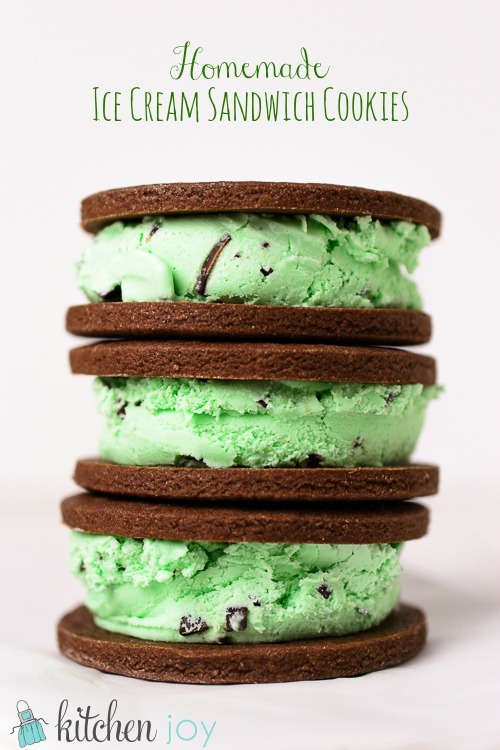 To assemble the ice cream sandwiches, let ice cream soften slightly while cookies are cooling, then add a scoop of ice cream onto half of the cookies. Top with remaining cookies and press to flatten slightly. Arrange on a baking sheet, cover, and freeze an hour or so until hardened. Seal in zipper storage bags or wrap individually, if desired.